Right from the fear of tipping the scales to slapping stupid faces with her sharp sarcasm, the Jamai Raja actress is every single person ever! 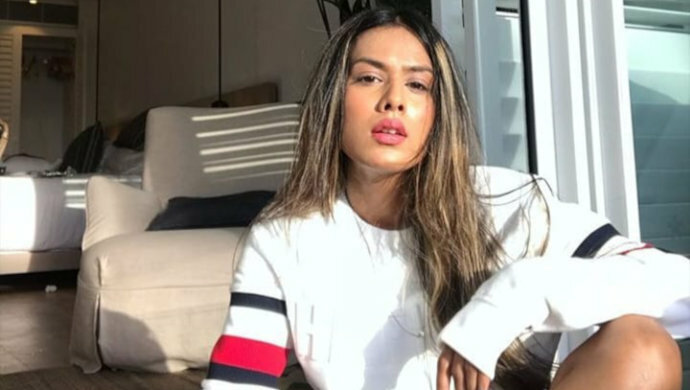 TV celebrity Nia Sharma – an actress, all-time fashionista and year-round inspiration and YET, she is one celebrity one can easily relate to. As amazing as she is at whatever she takes under her wings, the Jamai Raja actress never lets her sarcasm and wit take a backseat. Like, never ever. It would be safe to say that her brilliant timing and humour standards reflect fairly well on our screens. She never loses that grip on confidence. The Zee TV show star understands the struggle of keeping up with CALORIE-DARSHANS in the mirror every day. Diet ain’t easy. Because you know what they say, honey? A moment on the lips, forever on the hips. Nia gets it. She enjoys doing exactly what we do: Nothing! 3 weeks advance notice please! Folks, we have all been there. Not you? Well, that’s me like every month, during PMS. After too, probably. Who doesn’t have haters? Plus, it is an uninvited luxury when you are a celebrity. But Nia knows that people who speak poorly of you, are not worth your clock. Move the heck on! He faithful.. he loyal.. he all about me …he finds me the hottest..😭🌧 ‘holier than thou’ and earth 🌏 hasn’t shaken yet. Ladies, if he says all of this to you, it’s okay to call out his big fat lies. Nia says so. This is My ‘Zindagi aisi kyu hai’ face! Haven’t we all sat and contemplated all the curve balls life has thrown at us? Nia does too. Clearly, that’s so us! Front camera open and HAIR FLIP! Every girl ever. Somewhere between struggling to look awesome and then making peace with the fact ‘jaisi shakal hai waise hi rahegi’ ..!! On some days you are the rockstar, on others, just the rock. Relatable? No matter how many clothes a girl own, she will never have an outfit for any occasion. Nia clearly understands our pain. It’s an emotion. Honestly, we ALL relate to this. Nia Sharma, never change. I repeat, NEVER CHANGE. Meanwhile, continue your entertainment with the latest on ZEE5 – catch up or binge watch! How many of these posts can you relate to? Flood the comments sections with your thoughts. Share it with your friend and hit them right in the feels!